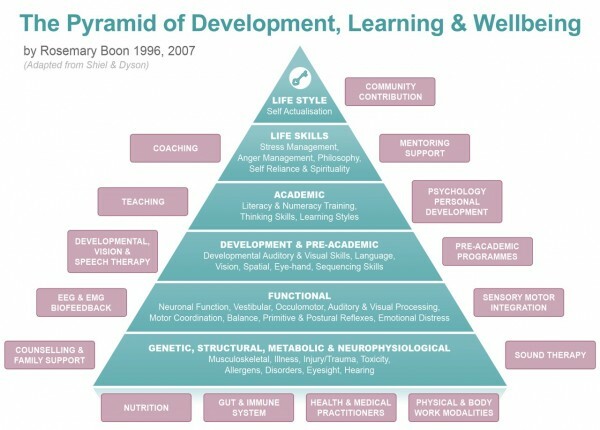 Working from the base to the apex of the pyramid, each succeeding level, ( representing an aspect of functioning of the individual) may need combinations of the therapies and interventions ( the boxes surrounding the pyramid ) preceding it. Only individual testing and assessment will determine which combination of interventions and the order of precedence that may be necessary to achieve optimal functioning and outcomes. Also see How we proceed for an explanation of how we proceed with the assessment process. It has been found that when the model is not followed, deficits in certain areas can go unaddressed and thus delay or even prevent, an individual’s ability to progress.